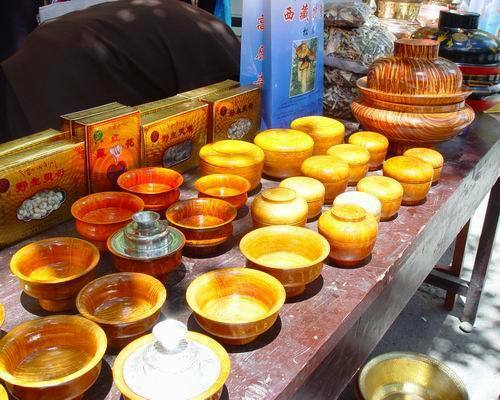 In common Tibetan families, there are always two wooden bowls, a big one and a small one, the former for the father and the latter for the mother. In well-to-do families, each wooden bowl has a silver lid, on which are carved patterns symbolizing good luck. In even wealthier families, every wooden bowl is inlaid with silver and carved with patterns, with only a finger-width part left in the middle of the bowl to show its wooden nature. Above it is the lid and under it is the tray, both made of silver. The lid is shaped like a tower and inlaid with silver and gold, on the top of which is a red agate forming a handle. The tray, which is especially unique, is in the shape of eight lotus petals, with a pattern of good luck on each petal altogether making up the traditional eight propitious omens. Why are the bowls of the father and mother always different in size? It is generally accepted that it is a sign of respecting the father, whose position is considered higher than that of the mother. Maybe this comes from Tibetan history. Under the rule of the former local government of Tibet, it was stipulated by statute that, "Men is classified into three classes: upper, middle, and lower classes, with each class further classified into three sub-classes upper: middle and lower sub-classes." The local government went on to state that "The poor belong to the lower sub-class of the middle class; their life is valued at 30-40 taels (roughly 1,140-1,520 grams) of silver. However, women belong to the lower sub-class of the lower class, their social position being equal to vagrants." Even to this day, the father's bowl is larger than the mother's. If a couple happens to visit another family, the latter will be sure to serve the wife tea in a smaller bowl than her husband; otherwise, it would be considered impolite. In everyday life, the wooden bowls are always tidily put in the cupboard, taken out when needed and put back after use, with everyone using his or her own bowl. There is a saying "The husband and wife use different bowls, father and son use different bowls, mother and daughter use different bowls, and brothers use different bowls." Any children who attempt to take their father's bowl and drink from it would be severely criticized by their parents, who would declare, "If you do this, you will not have any good luck in the future." The affection between husband and wife is also seen in the wooden bowls. If the husband is going on a long trip, after the wife sees him off and returns home, she first fills his bowl with tea and then pours tea for herself. When she drinks her tea, she pours out the tea from his bowl onto a clean place and puts the bowl tidily back into the cupboard. And, when her husband returns, she fills his bowl with hot tea and gives it to him with both hands. Grown-up children live separately and when they return to see their parents, they still use the same wooden bowls they used before. The only difference is that when the son and the daughter-in-law come together, the son uses the same wooden bowl he has used before, while the daughter-in-law is only given a temporary, which today is the china bowl. The same applies to the son-in-law who does not have his own wooden bowl in his parents-in-law's home. However, the son-in-law that has married into and is living with the family should be regarded as a different matter; he will have his own wooden bowl because he is the future master of the family.